Want to scuba dive without getting wet? In a first for the cruise industry, Crystal Cruises offers the opportunity to ride to the bottom of the sea via its own three-person submarine for passengers on its yacht-sized ship, Esprit. Acquired for a cool $2 million, the C-Explorer 3 is a sub that houses a pilot and two passengers. It can cruise at speeds of up to 3 knots, and dive some 300 meters (approximately 1,000 feet) into the sea for as long as 16 hours (though most experiences range from 20 to 30 minutes). 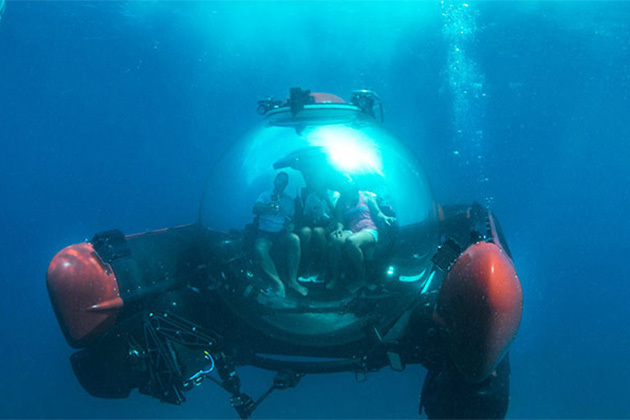 The sub has a 360-degree Plexiglas hull for fabulous reef and marine life spotting. The trip offered on select days on Esprit's Seychelles itinerary cost $599 per passenger. Note: The submersible experience will also be available when Esprit sails in other destinations, such as the Adriatic. The C-Explorer 3 experience has two components. First, you attend a briefing, held onboard Esprit, where you're thoroughly informed about how the sub works, the life support precautions Crystal takes and what to do in case the pilot loses consciousness. And you sign a very detailed waiver. I came away from the briefing feeling reassured that Crystal takes its operation of the vessel very, very seriously. You can take a camera or cell phone on your trip, but passengers are asked to take off any jewelry that could be sharp and accidentally scratch the Plexiglas. Next, you hop into a Zodiac and ride out to where the sub is positioned, a couple of thousand feet away from the ship. Here, too, all safety considerations are taken -- there's a boat nearby that is in constant communication with the sub's underwater pilot to monitor radar readings and measurements. Boarding the sub is easy. You slide off the Zodiac onto the sub's platform, hoist your legs over the hatch and lower yourself down into the capsule via a series of steps. The pilot -- in our case, Captain Thomas Larsen, whose regular job is to helm Esprit -- sits in the middle on a raised chair to man the controls and navigational technology. 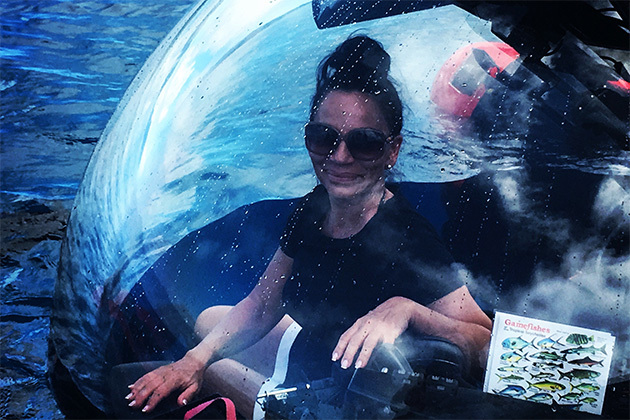 Even on the surface of the Indian Ocean, the 360-degree view is like watching life from the inside of a bubble. As serious as the pre-sub briefings were, it's relaxing once you're onboard. The captain, clearly loving the chance to treat passengers to the experience, turns on a CD -- "Finding Nemo," an appropriate choice. There are gentle exercises to make sure the tanks are fully ventilated (the equivalent of shaking the water out of both ears after a swim), and down we go. What did we see? While it can be hard to predict exactly what you'll spot, in Laraie Bay off Curieuse Island, we spied white tip sharks, sea urchins and fish such as big eye, butterflyfish, bannerfish, idol triggerfish, angelfish and more. Ultimately we traversed depths up to 60 feet. The ride lasted about 25 minutes (and went by so quickly it felt like 10). Re-entry was easy and also quite beautiful, particularly the moment when the submarine breaks through to the surface, and the sea, sun and sky all meld. It's not a cheap thrill -- but the chance to ride in a submarine doesn't come along all that often in life! Captain Larsen noted that there are some fascinating marine experiences to explore all over the world via the sub, and I'd definitely sign on again for a ride around a shipwreck. For those who are reluctant to try scuba diving, it's a nice, comfortable alternative. A handful of passengers were disinclined to try the sub, fearing it would feel claustrophobic. It didn't -- you sit upright, with plenty of space to shift around, and temperature and humidity are operated at comfortable levels. Another tip: By all means take photos but try to be present during the experience and just admire the views. 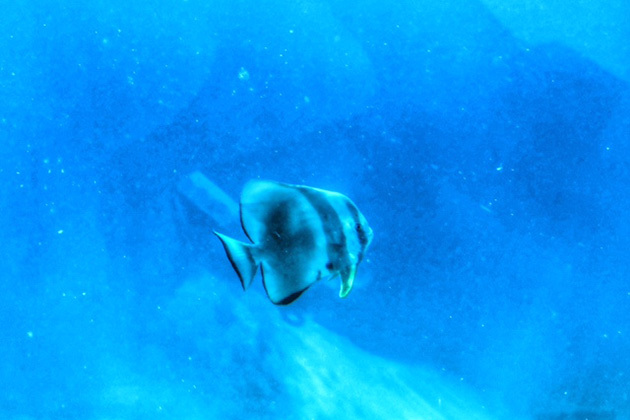 The marine life we saw seemed nonplussed about three pairs of prying eyes poking around through their reefs and waters. One fellow even put on a show for us, preening and posing. If you fall in love with the sub experience, you, too, can buy one. U-Boat Worx, which primarily designs and builds submarines for research, exploration and archaeology also makes a recreational model designed to fit on yachts (but be prepared to shell out a couple of thousand dollars).